NEW YORK -- After watching video of the line drive that broke his nose Monday, New York Yankees' rookie starting pitcher Bryan Mitchell feels fortunate. "Wow, I'm lucky for sure," Mitchell said in front of his locker Tuesday, wearing stitches across the bridge of his nose and darker than normal circles under his eyes. "I'm fortunate to be where I am right now." Speaking to a large group of reporters, Mitchell showed the mangled bill of the cap he wore in Monday's 8-7 win over theMinnesota Twins. The brim deflected a lined shot byEduardo Nunezfrom its route to center field, helping to lessen the blow to his face. Mitchell, 24, suffered a small nasal fracture and was placed on the seven-day concussion disabled list. There is a feeling that he could return to a major league mound shortly after he sits out a week. "I caught three days later," Yankees manager Joe Girardi said, referring to a broken nose he suffered during his playing career. Girardi said a broken nose should not limit Mitchell's return. Mitchell, though, has a concussion, according to Yankees GM Brian Cashman. Mitchell also suffered a concussion a month ago at Triple-A Scranton, while working out. On Tuesday, he went through the sequence that led to his injury. With one out in the second inning, he threw an 0-2 sliderthat Nunez smashed up the middle. Mitchell said he never saw the ball. Mitchell had been hit before by comebackers, but never so high. With blood gushing, Mitchell knelt over, finding some quick solace that he could still see and that his jaw was intact. The ball ended up in center field. "I basically said, 'I'm alright, just get me off the field,'" Mitchell said. Mitchell left with one arm around trainer Steve Donohue and the other holding a towel to dam the bleeding. The crowd gave him a standing ovation. When Mitchell returns to the mound, he said, he doesn't expect to have any fear. All and all, though, Mitchell was in good spirits; especially when he thought about what might have been. "It seems like a broken nose is not that bad, considering," Mitchell said. Baseball Tonight Spotlight: Yankees starting pitcher Bryan Mitchell leaves the game after being hit in the face by a line drive. 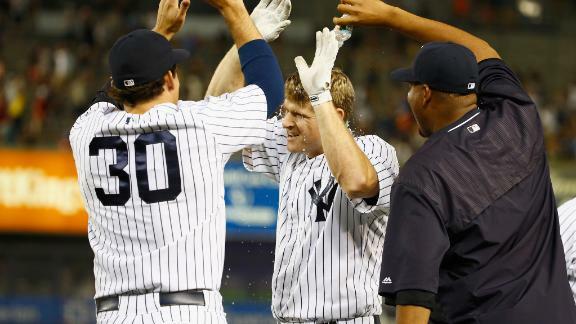 The Yankees walk off in the 10th on Chase Headley's groundout to shortstop.